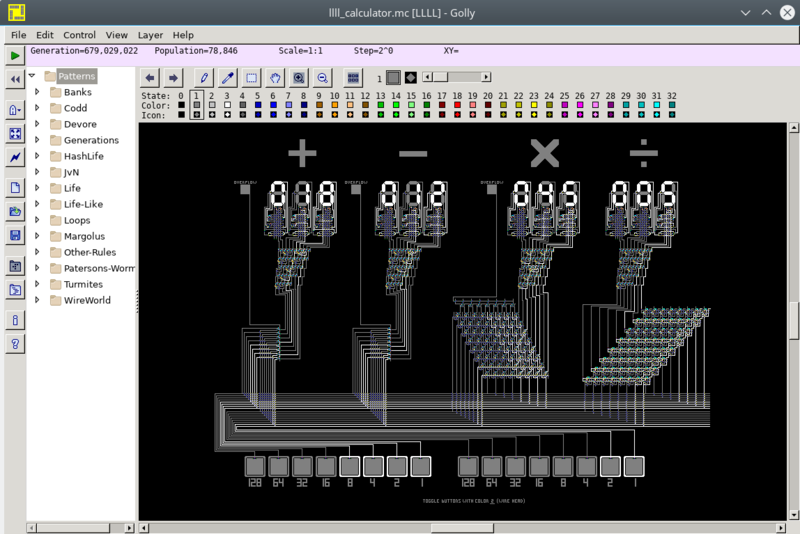 LLLL is a cellular automaton that allows building combinatorial and sequential logic circuits, such as a calculator with interactive buttons. While this is similar to WireWorld, its behavior is more closely related to Minecraft redstone. To run in Golly, which is a great cellular automaton simulation program that includes e.g. WireWorld as well, download the files below, place LLLL.rule in the Rules directory, and the mc files in the Patterns directory. The full specification can be found in the comments in LLLL.rule. An interactive tutorial showing all logic gates and so on is in specification.mc. LLLL was designed in 2015 and based on the esolang LLL. Copyright (c) 2015 by Lode Vandevenne. All rights reserved.